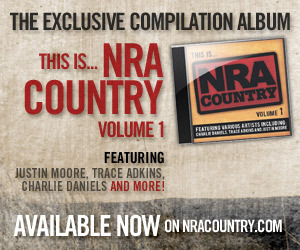 If you are then you’ll be excited to learn that the first NRA country music compilation album (This Is NRA Country Vol. 1) is now out in stores. This album is full of some great country songs. These songs are about the kind of folks that love the NRA and love everything the organization stands for. There is also a new track that I think you’ll like. You’ll find some of your favorite artists on this album. The entire collection of songs really makes sense. If you love that your have the right to carry a firearm then this is your kind of music. You take pride in your home and love to shoot a few guns once in a while. This album makes me want to go back out in the yard and try out my .44 Mag again. I love these kinds of compilation albums. You get a lifestyle and put together the kinds of songs you and others love. It’s a great soundtrack for a way of life. I think the NRA and everything it represents is absolutely something to celebrate. I’m glad to be associated with these great country artists and country songs as a proud supporter of the right to carry and own firearms. Of all the great songs on this record I do have to say that I like this one the most. It’s a new track (at least I haven’t heard it). Justin does a great job. There is no question he is a genuine. 2. A Country Boy Can Survive – Hank Williams Jr.
It’s Hank. The man is one of the longest supporters of the NRA and the right to bears arms out there. He’s been firing off guns for decades and his music has always represented that as well. Great song. Montgomery Gentry sure loves their hunting rights. This song is about the small towns out there and the good folks that live in them and love to hunt and shoot. A great song on a great album. This one always makes me smile. There is no other song quite like it out there. A huge hit a few years ago for Rodney Atkins. Trace Adkins has always been a man of his country. His songs are strong in support of his beliefs and this one is no different. A great song that really makes you proud. Craig Morgan has his own hunting show for goodness sakes. The man is a legend in the woods. Great song right here. You may not have heard it. I love this song. I still play it on quite a few of my playlists. I’m a big Josh Thompson fan and really hope he continues having success. You can’t beat Charlie. The man loves this country and everything it stands for. He’s a great American and country boy. John Rich had his American song as his only solo hit to reach the top 20. I’m sure he’ll have more before he’s done. He can really write a great country song. This one certainly belongs on this record. Lee Brice is one of those sleeper country artists out there right now. He’s had a few hits, but man does he deserve some more attention. This was his first hit and it’s a really great song. I’m glad it was included on this collection. If you’re a hunter you know there is nothing like opening day. I can’t even sleep the day before the deer season opens here in Wisconsin. It’s like an annual holiday. Rifle season is something that is passed on down through generations. It’s a great time of year. I love this song. It wasn’t a true hit, but it’s still a great song. And hey…that’s Thomas Rhett’s dad.